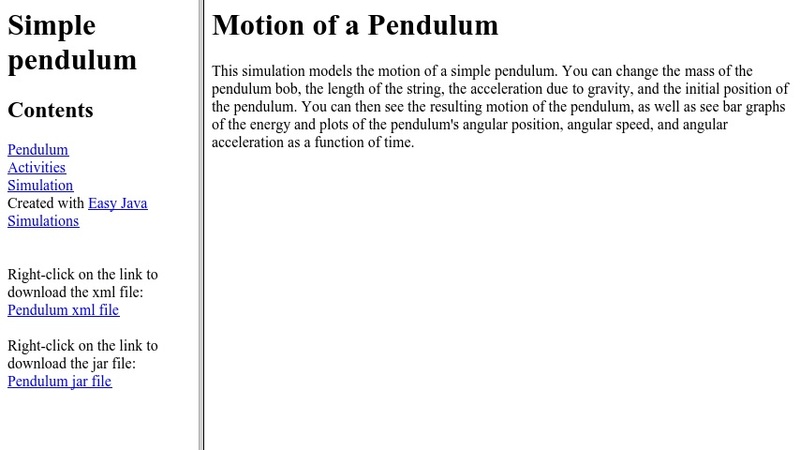 This interactive simulation models the motion of a simple pendulum. Users can explore how pendulum motion is affected by changing length of the string, initial angle, and mass of the bob. Adjust the acceleration due to gravity to simulate pendulum motion on another planet. Energy bar graphs can be displayed in stepped motion alongside the swinging pendulum to get a clear picture of kinetic/potential energy conversion. Click on "Forces" to see free body diagrams. Advanced learners can view graphs of angular position, angular velocity, and angular acceleration as well. The model is simple enough for middle school students to manipulate, yet also provides an array of robust tools that render it appropriate for introductory physics courses. See Related Materials for a multi-day module on simple harmonic motion (Science NetLinks) and for instructions on installing and running the cost-free EJS Modeling and Authoring Tool. This applet was created with EJS, Easy Java Simulations, a modeling tool that allows users without formal programming experience to generate computer models and simulations.